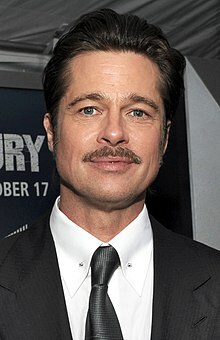 William Bradley "Brad" Pitt is an American actor and producer. He has received multiple awards and nominations including an Academy Award as producer under his own company Plan B Entertainment. William Bradley "Brad" Pitt (born December 18, 1963) is an American actor and producer. He has received multiple awards and nominations including an Academy Award as producer under his own company Plan B Entertainment. Pitt first gained recognition as a cowboy hitchhiker in the road movie Thelma & Louise (1991). His first leading roles in big-budget productions came with the dramas A River Runs Through It (1992) and Legends of the Fall (1994), and Interview with the Vampire (1994). He gave critically acclaimed performances in the crime thriller Seven and the science fiction film 12 Monkeys (both 1995), the latter earning him a Golden Globe Award for Best Supporting Actor and an Academy Award nomination. Pitt starred in the cult film Fight Club (1999) and the major international hit Ocean's Eleven (2001) and its sequels, Ocean's Twelve (2004) and Ocean's Thirteen (2007). His greatest commercial successes have been Troy (2004), Mr. & Mrs. Smith (2005), and World War Z (2013). Pitt received his second and third Academy Award nominations for his leading performances in The Curious Case of Benjamin Button (2008) and Moneyball (2011). He produced The Departed (2006) and 12 Years a Slave (2013), both of which won the Academy Award for Best Picture, and also The Tree of Life, Moneyball, and The Big Short (2015), all of which garnered Best Picture nominations. As a public figure, Pitt has been cited as one of the most influential and powerful people in the American entertainment industry, as well as the world's most attractive man, by various media outlets. His personal life is also the subject of wide publicity. Divorced from actress Jennifer Aniston, to whom he was married for five years, he has been married to actress Angelina Jolie since 2014. They have six children together, three of whom were adopted internationally. In September 2016, Jolie filed for divorce from Pitt. After Brad Pitt was cut off after going on his allotted time at a Los Angeles County board meeting, Roz Weston and Graeme O'Neil react during ET Canada Live. A compilation of Brad Pitt's Funniest Moments!